The use of a distinctive red label for premium-priced records made by top-tier artists was a marketing strategy suggested by the Gramophone Company's agent in St. Petersburg, Russia, where the first "Gramophone Record Red Seal" discs were issued in late 1901 or early 1902. Later in 1902 the practice was adopted by the home office in the United Kingdom, which preferred to refer to the records as "Red Labels", and by its United States affiliate, the Victor Talking Machine Company, in 1903. Led by the great tenor Enrico Caruso, then just at the beginning of his worldwide fame, Red Seal records changed the public's valuation of recorded music. Caruso's first records, made by the Gramophone Company in Italy in 1902, earned prestige as well as profits for the company and its affiliates. 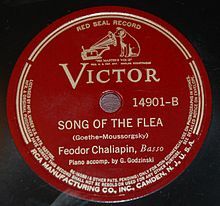 Victor issued several of these records on their Red Seal label in the United States and soon other famous opera stars and classical instrumentalists were attracted to the studios of Victor and the Gramophone Company, consolidating the positions of both firms as the market leaders in the field of serious music by famous performers. Early acoustical (non-electronic) recordings could be a surprisingly good medium for capturing the sound of singing voices, male voices especially, but while acceptable solo piano and violin recordings could be made, the acoustical process yielded only a flat, muffled, tinny echo of a symphony orchestra. The introduction of electrical recording (or "orthophonic recording", as Victor named its version of the process) in 1925 allowed reproduction of instrumental and orchestral music with greatly improved fidelity. In 1929, the Victor Talking Machine Company was purchased by the Radio Corporation of America (RCA), thereafter becoming RCA Victor and, in 1968, RCA Records. RCA Victor's Red Seal series continued its pre-eminence from the 1930s through the 1950s due partly to the recorded output of three of the leading conductors of the time, Serge Koussevitzky, Leopold Stokowski, and Arturo Toscanini. Nearly all of Toscanini's recordings were issued on the Red Seal label, most of them with the NBC Symphony Orchestra (NBC was an RCA subsidiary until 1986). Conductor Arthur Fiedler and the Boston Pops Orchestra spent nearly 35 years with RCA Victor and made many best-selling Red Seal recordings. Stokowski and the Philadelphia Orchestra made Red Seal records exclusively from 1917 until 1940. Stokowski would continue to make many Red Seal recordings with various orchestras, sporadically until 1975. Eugene Ormandy made his first recordings with the Minneapolis Symphony Orchestra in 1934 and with the Philadelphia Orchestra beginning in 1936. Ormandy and the Philadelphians returned to RCA in 1968, after spending 23 years (1944–67) with Columbia Records. Leonard Bernstein also made his first recordings for RCA Victor. In 1950, RCA Victor began issuing vinyl LPs (originally introduced by Columbia Records in 1948), because they were losing artists and sales due to the company's resistance to adopting the new format. In 1954, RCA Victor began experimenting with stereophonic recording. The first RCA Victor "Stereo Orthophonic" reel to reel tapes were issued in 1955. When stereo LP records first appeared in 1958, RCA Victor introduced their highly regarded "Living Stereo" recordings. During this period RCA was consistently seen as producing some of the finest-sounding recordings then available. In 1968, RCA introduced a modern logo, de-emphasized the Victor name and "His Master's Voice" trademarks, and the label came to be known as "RCA Red Seal". After General Electric absorbed RCA in 1986 and sold its interest in the record division to Bertelsmann, the Victor name was revived so the label once again became "RCA Victor Red Seal" before eventually de-emphasizing the Victor and "His Master's Voice" trademarks again, and reverting to "RCA Red Seal" in the early 2000s because of worldwide fragmented ownership of the "His Master's Voice" trademark. The following instrumentalists, vocalists, conductors and orchestras have all made Red Seal recordings. Some recordings were made for other overseas companies but were distributed in the US on the Red Seal label. Many have also recorded or may be currently recording for other labels. The RCA Gold Seal mid-priced label was launched in 1975 and initially consisted mainly of reissues of "Living Stereo" recordings from the late 1950s and 1960s previously issued on the Red Seal label. Beginning in the 1980s, many older Red Seal recordings from the 78 RPM and early LP era were reissued on the Gold Seal label. This included recordings by Golden Age opera stars such as Enrico Caruso, Amelita Galli-Curci, Ezio Pinza and Rosa Ponselle, as well as renowned virtuosos like Vladimir Horowitz, Arthur Rubinstein, and Jascha Heifetz. RCA Victor Gold Seal released complete sets of recordings by Arturo Toscanini, Fritz Kreisler and Sergei Rachmaninoff, among many others. Sony has apparently retired the Gold Seal label and now reissues all historic Red Seal recordings from the RCA Victor archives on the RCA Red Seal label. In the early 1990s, many Red Seal recordings were reissued on the budget-priced RCA Victor Silver Seal label. Several of these recordings were by lesser known performers, but the series also included some well-known Red Seal artists, including conductors Leopold Stokowski, Zubin Mehta and Charles Munch; pianists Emanuel Ax, Byron Janis and Alexis Weissenberg; the Guarneri Quartet and guitarist Julian Bream. Recordings in this series were issued on CD and cassette only and did not contain liner notes. ^ Label scans of some of the first Red Seal records, issued in St. Petersburg circa early 1902, showing explicit use of the words "Red Seal". Accessed 9 November 2016. ^ Morton, John Fass (2008). Backstory in Blue: Ellington at Newport '56. Rutgers University Press. p. 49. ISBN 978-0-8135-4282-9.